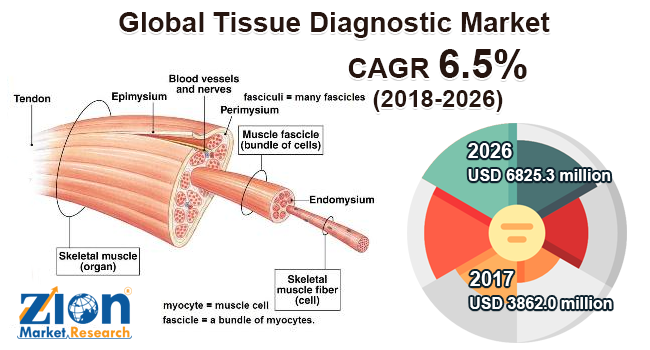 Global tissue diagnostic market expected to generate revenue of around USD 6825.3 million by end of 2026, growing at a CAGR of around 6.5% between 2018 and 2026. The demographic development and profile together with rising treatment potential lead to a lot of challenges to augment the productivity of healthcare. The report covers forecast and analysis for the tissue diagnostic market on a global and regional level. The study provides historic data for 2016 and 2017 along with a forecast from 2018 to 2026 based on revenue (USD Million). The study includes drivers and restraints for the tissue diagnostic market along with the impact they have on the demand over the forecast period. Additionally, the report includes the study of opportunities available in the tissue diagnostic market on a global level. In order to give the users of this report a comprehensive view of the tissue diagnostic market, we have included the competitive landscape and analysis of Porter’s Five Forces model for the market. The study encompasses a market attractiveness analysis, wherein all the segments are benchmarked based on their market size, growth rate, and general attractiveness. The report provides company market share analysis in order to give a broader overview of the key players, in the market. In addition, the report also covers key strategic developments of the market including acquisitions & mergers, new diseases launch, agreements, partnerships, collaborations & joint ventures, research & development, Diseases and regional expansion of major participants involved in the market on the global and regional basis. Moreover, the study covers price trend analysis, applications portfolio of various companies according to the region. The study provides a decisive view of the tissue diagnostic market by segmenting the market based on product type, technology, diseases, end-users, and regions. All the segments have been analyzed based on present and the future trends and the market is estimated from 2018 to 2026. By product type, the market is segmented into consumables and instruments. The consumables segment is further classified into kits & reagents and probes. The instruments segment is sub-segmented into slide-staining systems, scanners, tissue-processing systems, and others. Based on diseases the global tissue diagnostic market is segmented into immunohistochemistry (IHC), in situ hybridization (ISH), Digital pathology and workflow management, and special staining. Technology segment in global tissue diagnostic market is bifurcated into breast cancer, gastric cancer, lymphoma, prostate cancer, non-small cell lung cancer (NSCLC), and others. Hospitals, research laboratories, ambulatory surgical centers, diagnostic centers, and others are the key end-user segment of the global tissue diagnostic market. The regional segmentation includes the current and forecast demand for North America, Europe, Asia Pacific, Latin America, and the Middle East & Africa with its further segmented into major countries including the U.S., Rest of North America, the U.K., Germany, France, Italy, Spain, Rest of Europe, China, Japan, India, southeast Asia, Rest of Asia Pacific, Brazil, Rest of Latin America, GCC Countries, South Africa and Rest of Middle East and Africa. This segmentation includes demand for tissue diagnostic market based on individual product, technology, diseases, and end-users in all the regions and countries. The report also includes detailed profiles of end players such as Roche Diagnostic, Agilent Technologies, Danaher Corp., Genomic Health Inc., 3DHISTECH, Abbott Laboratories, GE Healthcare, Becton Dickinson & Co., Cell Signaling Technologies, Thermo Fisher Scientific Inc. among others.